Definition at line 529 of file _function_adaptors.h. Definition at line 530 of file _function_adaptors.h. Definition at line 532 of file _function_adaptors.h. Definition at line 533 of file _function_adaptors.h. Definition at line 535 of file _function_adaptors.h. 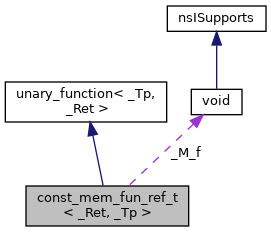 Referenced by const_mem_fun_ref_t< _Ret, _Tp >::operator()().